Hitting a star wall is worth the same amount of points as killing a bumper baddie, and it’s quicker. 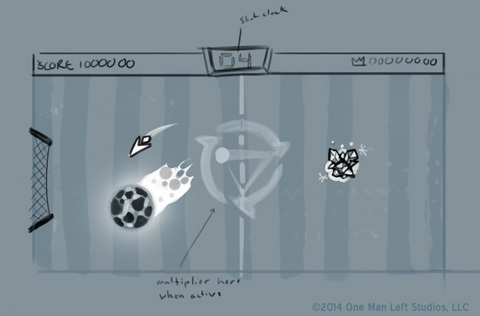 Dribbling 3x on a star wall triggers the star beam, which clears a portion of the screen. These kills are worth more than double the norm. Double, triple, and multi-kills each provide a score bonus, so when you can, kill in groups. Dribbling an enemy to death (not touching any walls) is a perfect kill, worth 5x the norm. Superball kills are also worth 5x the norm. Try filling the screen with enemies before you fill those background stars! Never resting, because we are machines, we’re already winding up production on a small side project. More on that soon. Tilt to Live 2 Soundtrack: Free for a Day! This promotion is over now. RIP, Frederick. Did you know that today is Free Soundtrack Day? It’s the one day each year that we remember the sacrifices of Frederick P. Soundtrack, a man who gave all of his music away for free until he finally starved and died. And his family, who depended on him to earn a living, also starved and died. And so, we celebrate by setting the Tilt to Live 2 Soundtrack to FREE for a day, from now until whenever I remember to switch it back tomorrow, or until we run out of free download credits from Bandcamp. Whichever comes first. If all goes according to plan, you can expect Tilt to Live 2’s Brimstone Pinball update to arrive next Thursday! One important element was missing from our GDC gameplay videos: Baron Brimstone’s insightful commentary. 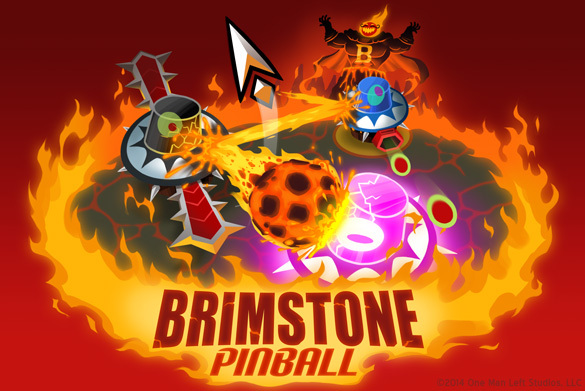 Brimstone Pinball will be hitting Tilt to Live 2 in a few weeks with 15 new achievements and a fresh leaderboard to conquer. If you’d like a reminder when the new DLC is released, be sure to sign up for our mailing list. Getting back in our groove, we spent the week implementing and playtesting some tough new achievements for Brimstone Pinball. 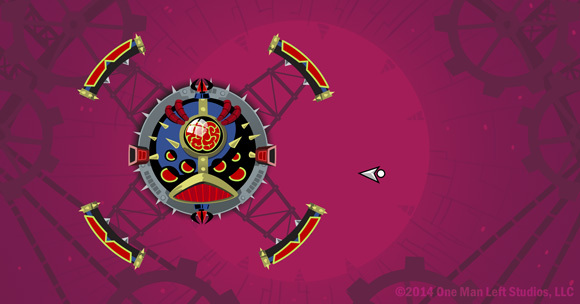 There’s also a neat pinball plunger intro animation we added. Big “thank you” is owed to the playtesters that have gotten back to us with feedback so far. We might not respond to everything, but we do read it all carefully. Now I’m flailing around in Adobe Premiere trying to remember how trailers are made. We’ve settled on a release date, but I’m not going to commit us to it publicly this week. It’s in April, and we’re shooting for iOS and Android at the same time. And we’re back from the Game Developer’s Conference. It’s always great to spend a week outside of our bubble and get some insight from our peers. We got to try a lot of cool stuff that other mobile developers were up to (Unpossible, Adventure Beaks, Monsters vs. Monacles) and got some great feedback on Tilt to Live 2’s new Brimstone Pinball gametype. This was actually the first time we’d put it into someone else’s hands, so it was great to see people hitting that retry button without us even asking. You can watch our early build of Brimstone Pinball in action at the links below (I don’t think we ever quite get to the hardest waves of enemies). Huge thanks to the press people on this list for giving us the chance to show you our project! With an early build of the new gametype in tow, we’re off to the Game Developers Conference for a week of learning and fellowship. 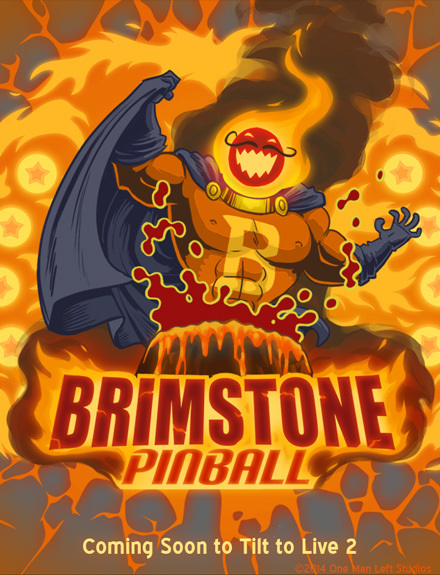 If you stumble across us at the conference, be sure to ask for a demo of Brimstone Pinball. It’s still young and in need of feedback, especially in regard to difficulty. This is Baron Brimstone, our sinister pinball mascot. He looks forward to incinerating you with his army of tricked-out, evil pinball bumpers. 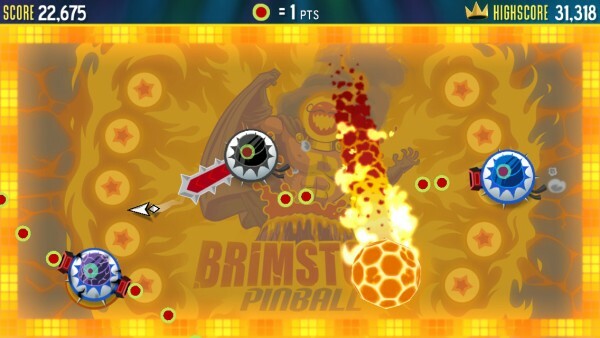 If you’d like an email reminder when Brimstone Pinball hits Tilt to Live 2, you can sign up here! 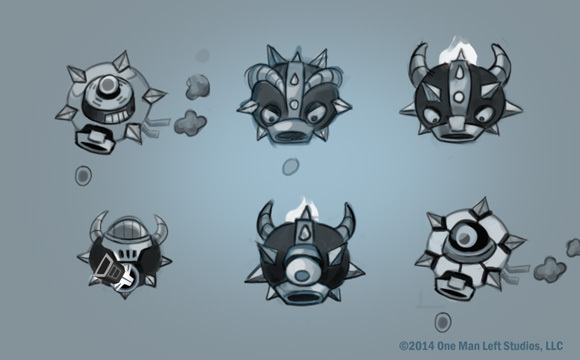 This was an idea we thought had some promise: bat the brimstone into goals that appear along the arena’s edge, while beating up some new and more durable enemy types. The little ice bricks would destroy your brimstone on impact, so you wanted to try to dribble around those. There was also a shot clock component, where you’d either lose your combo or die if it ran out before you could score your next goal. The prototype felt decent, but it just wasn’t that fluid. It was while we were spit balling ideas for improvement that this mode took on a whole new life. Next week, we’ll finally show you what you can expect for the first Tilt to Live 2 expansion. 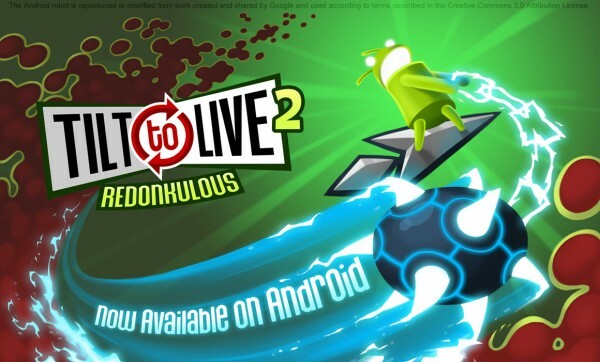 Tilt to Live 2: Now on Android! Today is Tilt to Live’s 4th birthday, and we’re celebrating with the long-awaited release of Tilt to Live 2 on Android! Now more people than ever can experience the magic of the laser mace, and the child-like wonder of the hungry shield. It plays on both Android mobile devices and tablets, and will run best on mid-to-high end devices made within the last few years. If you experience any technical issues, don’t hesitate to let us know.